Now this is a very rare one. A Bentley Hooper Empress II has come up on ebay. Item number 170182728629 and this beauty has a Buy it Now price of $200,000.00. This pictures seem not to be working, so there is only the above one currently. It has travelled only 12354 miles and has never been registered in America. It seems like it spent its life so far in Japan. 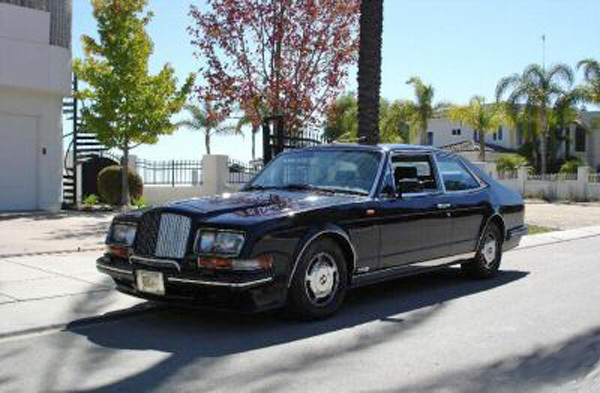 It is VIN number SCBZR03D2LCX32776, the same car as a Bentley Spotting reader was offered in September $150k USD. Read about their post here. Here is an opportunity to purchase a piece of motoring history! This masterpiece is extremely rare, I believe only 6 built and only two of them are in the US! It's worth over US$ 1 million!! The coachwork was built in all alloy by Hooper in 1990. It has only gone 12354 miles! Still like new, looks and smells as fresh as the date of installment. Both the exterior and the interior show incredibly well with no scratches or dents. Everything works perfectly---drives and runs flawlessly! Don't miss this chance to own this masterpiece, it will make a great addition to your car collection!! *this is US car but never been registered in the US. come with shipping documents and bill of sale." More information about this very rare coach built Bentley can be found here when one was spotted in Monaco, the original advertisement from Hooper can be found here, and another one that was for sale in France can be read about here.